What does it take to complete a successful IT project in today’s economic conditions? How are you, as project manager or IT director with ever limited resources, going to cut costs while you continue to support business applications or IT infrastructure. Many companies, especially in the SMB market, find the only answer is to stop supporting them (or drastically reduce the support) and see what ‘happens’. This of course puts the business applications that are relied on in a very fragile and brittle state, and is really a temporary solution at best. 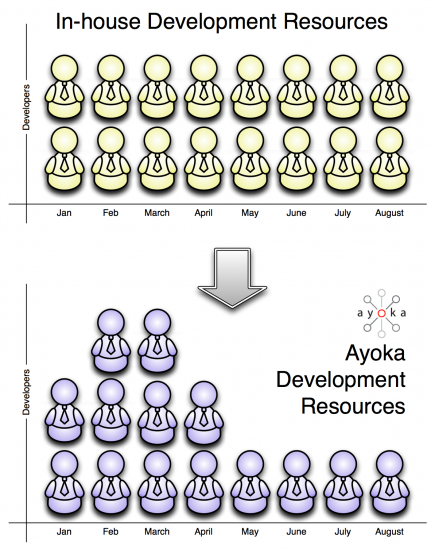 The good news is that there is a solution, partnering with Ayoka. At Ayoka, we can help our clients move their IT systems in the right direction: towards a more maintainable environment that provides true return on investment and quickly shows results. We usually accomplish this within three steps, and although every client has their own unique aspects this can generally be applied across the board. First, we will bring in our project managers, analysts, developers, and architects to become familiar with the current system and find the main pain points, or issues that are addressed or appear on a common basis. The line of business is generally well aware of these issues, although they may not understand the technical details. They may even have discovered ingenious work-arounds that allow them to accomplish their goals in the mean time. Our developers will start becoming familiar with the current processes and the system code base, and will be able to apply necessary fixes as the need arises. This is a learning process for our client as well, since they will start becoming familiar with issue tracking systems, user acceptance tests, and agile development processes. The next step is to introduce processes, practices, and of course, technology to streamline the IT system, improve performance, and lay in the foundation for new features and applications. This may also involve putting good test suites in place and start paying off the technical debt that has been incurred by harried developers over the years by refactoring the code base so it’s more maintainable. This often also includes integrating separate systems to reduce the need for rework and reentry of data. Many times, our clients’ development team doesn’t even know what continuous integration is, or the benefits of using a code repository and an integrated issue management and tracking system. The developers are too wrapped up in the day-to-day business of meetings and putting out fires to be able to take the time to research the benefits of these tools and integrate them into the project management lifecycle. Finally, the application is now in a stable state and can be maintained with far less resources than was required before. More importantly, processes have been established and practices are now put in place so that the line of business and technical team know exactly how to interact and address issues and requests as they arise. The chart above compares the traditional in house developer model for a legacy application or custom built solution compared to the cost derived from the Ayoka model we’ve been describing. As can be expected, the first and second stages may involve a ramp up in terms of short term resources and therefore cost a little more than the base the client was paying for dedicated resources. However, as the application moves into the stable state our model quickly shows an advantage and the return on investment is realized within a few short months.